I’m not sure ramen is the best pre-theatre food – it’s too comforting and often all I want to do afterwards is go home and sit. However, it had been a while since my last post and there was a restaurant I wanted to check out just around the corner from the Haymarket Theatre, so it seemed like the obvious choice. 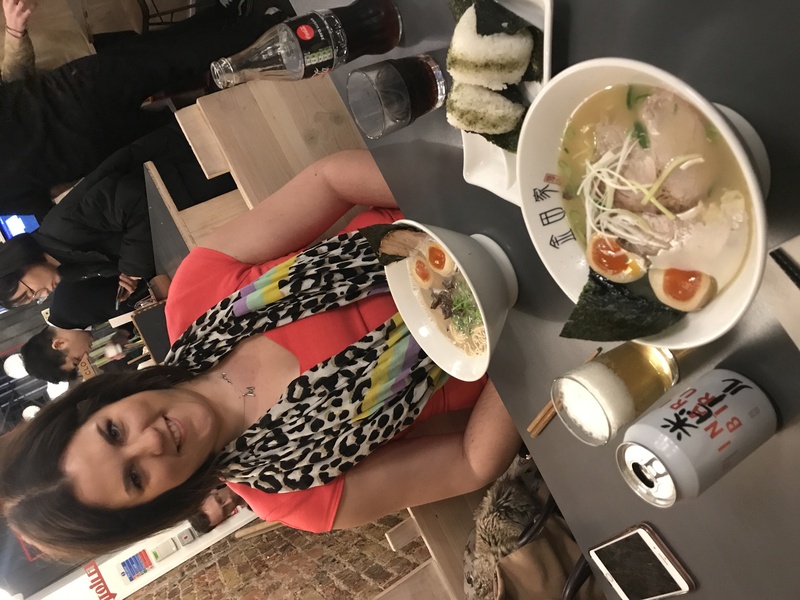 Kanada-Ya has got a few branches in London (I’ve previously reviewed the Covent Garden branch) but this time it was the Piccadilly shop that we called in to. They don’t seat incomplete parties and Mel was running late (she has a geography degree but she got lost!) so I was doing my best to defend our place in the queue. Side note: One thing I liked about restaurants in NYC is the system for putting your name down, we should import that. The bonus of ramen is that it’s quick and people don’t drag it out, so it wasn’t long before we were seated. I ordered the salmon onigiri to start, I chose the Chicken Paitan and Mel opted for the basic Tonkotsu ramen. We both naturally added an egg, which should always come as standard (I am prepared to die on this particular hill). The onigiri looked better than they tasted; a more liberal squirt of mayonnaise and a bit more salmon would have improved it no end. The noodles were great, just the right firmness (hard) and my broth was thicker than some of the chicken broths I’ve previously tried. I also had a beer, purely because it had the same name as my cat! We didn’t stay long because we had to collect tickets and go see a show, but I’d definitely go back to Kanada-Ya again. Also – a shout out for them being the only ramen joint I’ve visited that has a specific kids ramen menu. Kanada-Ya Piccadilly gets a solid 4/5. Finding a ramen place on holiday isn’t difficult, especially in North America. 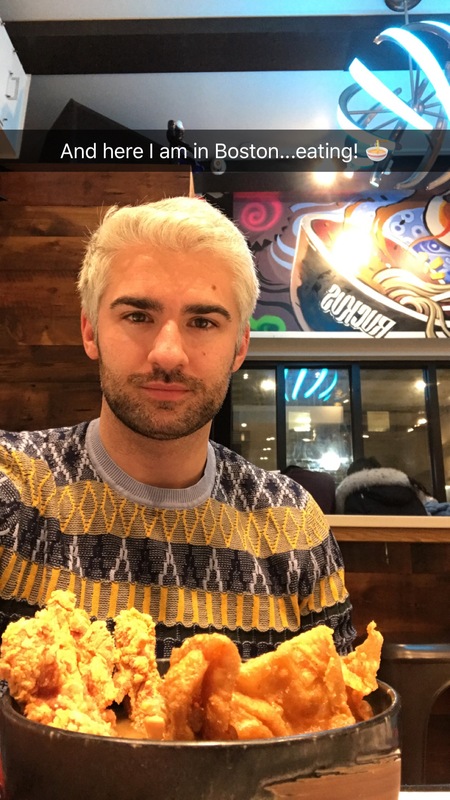 But choosing a ramen place on holiday is a whole ‘nother matter. 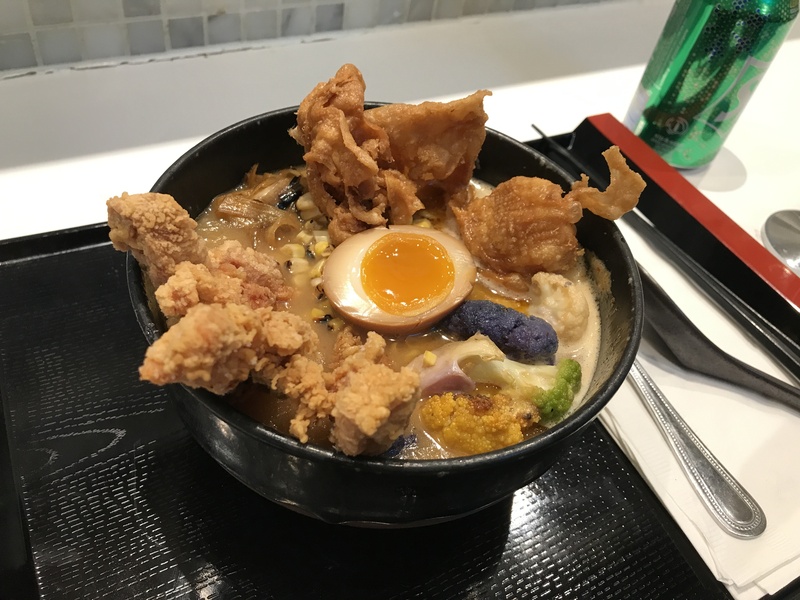 I depend heavily on “Top 20 ramen joints in [city]” articles to narrow down the options for me. 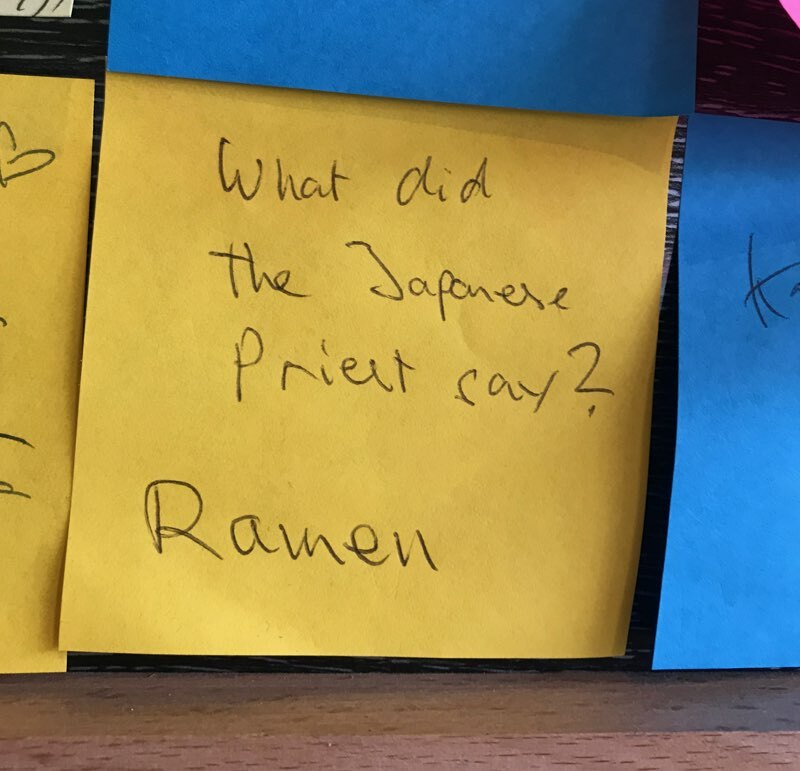 That’s how I discovered Ruckus Ramen in Boston, which appeared in this Thillist list. I had arrived just as they were opening, so I was awkwardly the only patron for a little while. I also missed the instruction to order at the cash register (check me out using Americanisms) so there was a bit of a standoff whilst both sides waited for the other to make a move. 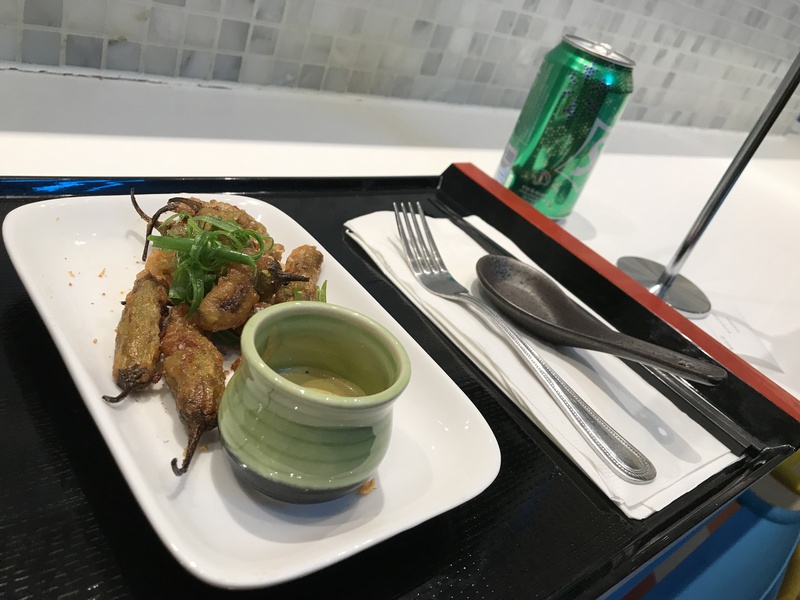 Eventually, I placed my order for tempura pickled Padron peppers and the Tori Paitan ramen, mainly beause it was heralded as a ‘crowdpleaser’ in that list I found. The Padron peppers were delicious, salty, sour, crispy…everything I like! However, I was disappointed when it came to the noodles. Not because there was anything wrong, but I definitely ordered badly. I was seduced by what Ruckus call ‘swag’ but everywhere else calls extras. I’d pimped my ramen, with something called an umami bomb, and friends, it bombed. The crispy chicken skin was not, and it just made the broth gloopy with collagen. Unfortunately, I was unable to finish it because it was just too thick. That aside, heritage cauliflower was an interesting topping and something that I would try again. Looking back there are other things on the menu which I should have ordered instead (step forward black garlic mazeman) so, the moral of this story is definitely to take time to read the menu in detail! It seems unfair to rate Ruckus badly due to inept ordering, but if you’re going to force me I’d give it 2/5. It’s a rare occasion that I’m early for, well, anything. But a diary misunderstanding today meant that I ended up two hours early for a thing. 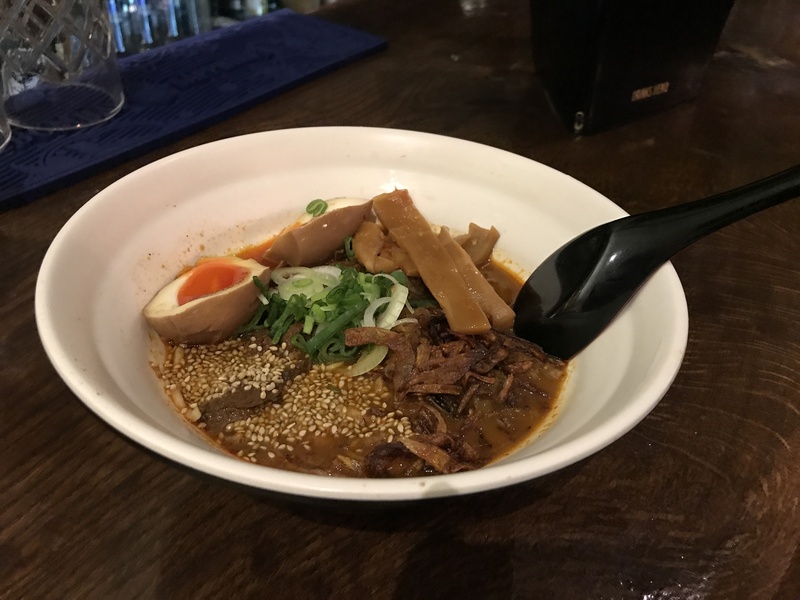 After eating, drinking, browsing, reading and general perusing…I even had time to update on some recent ramen adventures! Joy of joys! My last visit to Nanban was on 31 December 2017. I remember then being intrigued by the idea of curried goat ramen. After 364 days, I surrendered to the nagging voice in my head and headed back to the Brixton restaurant. I was not disappointed. 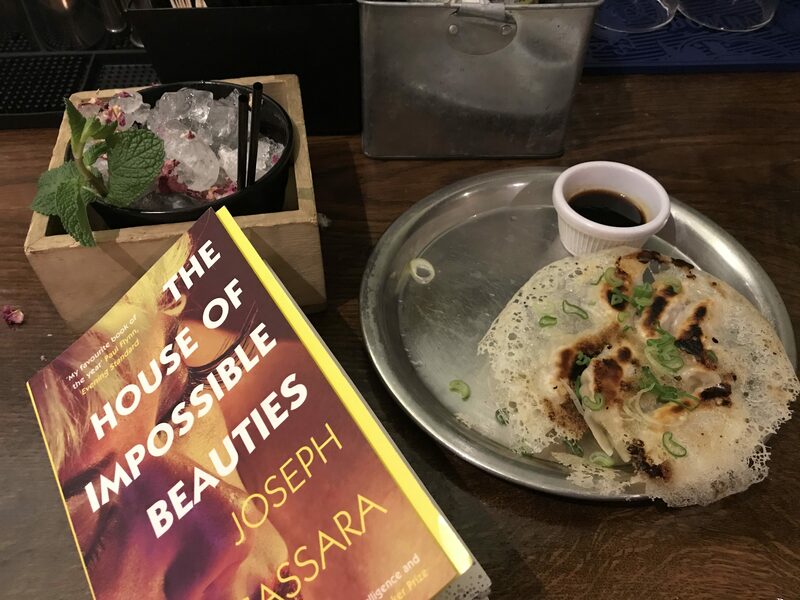 I had a cocktail (because; festive), placed my order (because; hungry) and settled back in to my book (because; other resolutions). Crispy gyoza is a cool idea, but they tasted a bit greasy. The noodles were delicious though. Spicy, slightly sour broth, and meaty hunks of goat dotted through the bowl. It’s not the best egg that I’ve ever had, but hard to really find fault! I think I’d still prefer soft and juicy pork belly as the meat, but I’m always up for trying new things, and would definitely return to Nanban again to assess the seafood ramen, which isn’t an option you see in a lot of places. It’s slightly on the expensive side compared to other options in London, but you get what you pay for and so as a ‘last meal of 2018’ I felt it was justified. I think I’ve given up on my rating system (although it would probably be a solid 4). In hindsight,the system wasn’t well enough developed at the outset, and I’m not sure after so many posts that I can introduce something new. What to do dear reader?! If in doubt, eat more ramen! Peace. Guys!! 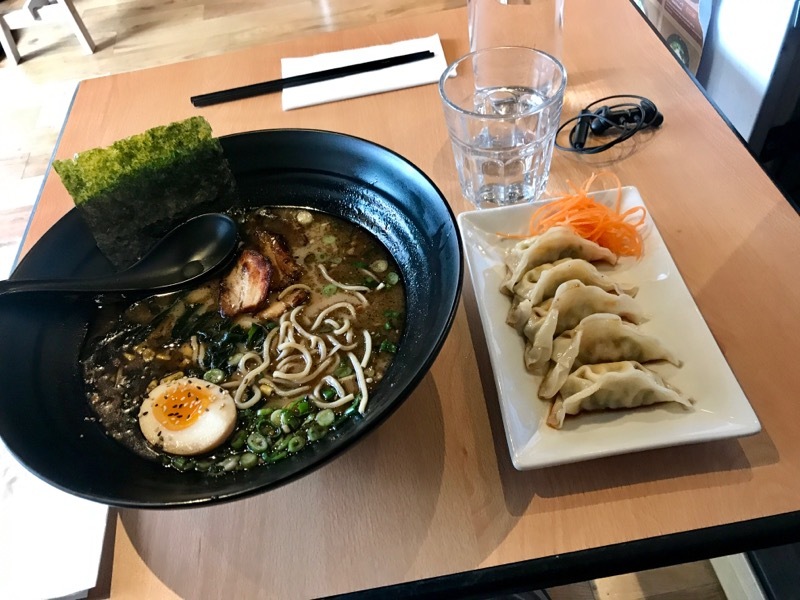 I thought I did a noodle hat-trick in New York City, but then I was going through my photos and realised I actually squeezed in 4 bowls of deliciousness. I’m fairly sure me forgetting Ramen-ya tells you quite a lot already, without me actually telling you anything yet. It wasn’t bad ramen. It wasn’t great ramen. So I guess that makes it ra-meh-n? 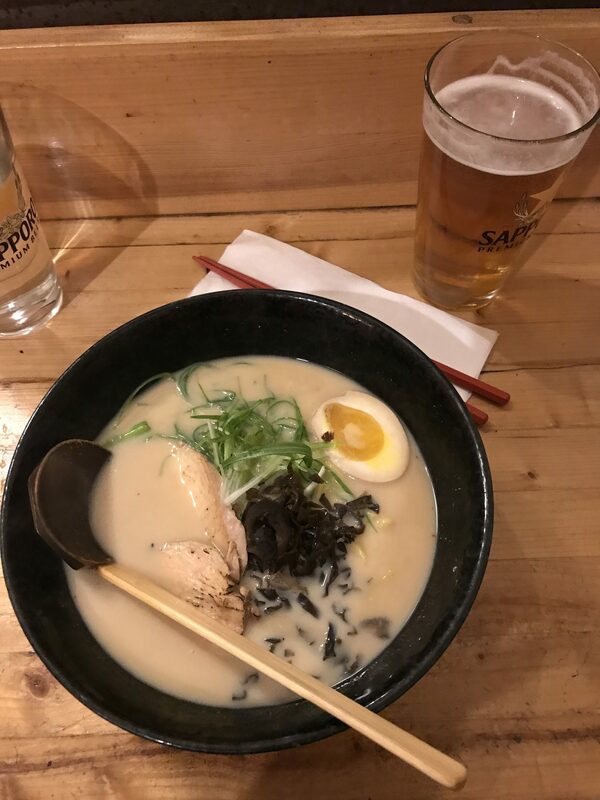 It was a busy night in Greenwich Village, and Ramen-ya was busy too. But again, as a single diner, I was slotted in at the counter straightaway. However, someone had had the genius plan to not have the kitchen visible behind the counter, so you just looked upon an empty void used for storage of boxes. I chose the miso Tonkotsu. It was everything you would typically expect, pork, mushrooms, egg. All very tasty, but to be honest after Mr Taka, the next noodles were always going to have to step up their game to be in the same league. Would I go back? Sure, but only if other options weren’t available. Ramen-ya, you were perfectly ok, but nothing really set you apart. I’m therefore giving you a firm 3/5.